Having enjoyed Shorto’s much more recent book, Amsterdam:A History of the World’s Most Liberal City, in August I accidentally came across this older Shorto work on sale. I have general interest in the history of the Bible/Jesus/Church anyway, so this piqued my interest. Shorto starts out with a Preface and then an Introduction for the 2012 edition – good. Then comes the 1997 Introduction before getting to the substance of the book. In the Introduction Shorto gives some background on Jesus and his own background (Catholic) He states he left organized religion, but has tried to come to grips with Christianity anyway. 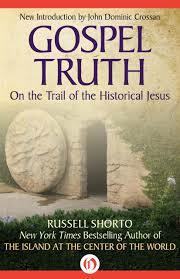 Then he introduces the study of Jesus as history – by its nature studying Jesus as history separates the miracles. Shorto addresses spirituality and the connection between it and scientific evidence, as we know it. Chapter 1 – Studying the historical Jesus since the Dead Sea Scrolls – differences of opinion – the Bible is no longer the “authority” in academic circles. Chapter 2 – Jesus of Nazareth is not the guy we were taught about in Sunday School – but what, who, exactly was he? Question of the ages. Poor boy from Nazareth – apocalyptic prophet, modeled on Old Testament prophesies, “virgin” birth stuff, etc. How the Gospels were written after the sack of Jerusalem – Jewish community split – Jesus teachings were very different in their “radical egalitarianism.” – The disciples were so passionate that Jesus must have been “a figure of astonishing originality.” (p. 40) Where did he get it? Nazareth was not the backwaters – it had quite a lot of Greek influence. Josephus prior to Dead Sea Scrolls. Area of Dead Sea Scrolls – Essene and Qumran communities and those Jewish rituals – was he apocalyptic when he lived or was that the Gospel writers’ later gloss? – nope – Jesus was a Jew of his times and place, apocalyptic and wrong. Chapter 4 – Much Greek influence in Nazareth – Hebrew Bible – translation difficulties -names, hellenization of Jerusalem in 175 BC – religion was challenged, Zeus instead of Yaweh, etc. But the Jews rebelled and Jerusalem became Jewish in 165 BC – see Maccabees -http://en.wikipedia.org/wiki/Maccabees. -Battle for leadership with Jonathan and Simon Maccabeus the took over the leadership from Zadokite succession which went to Umram and became Essene sect. took on Greek belief in heaven. Jewish Palestine had Greek influences. Pythagoras influenced Essene culture but the cult-type groups died out. The Jews rebelled, Herod cracked down and his son cracked down and Rome stepped in. Taxes high – offerings for absolution high – possibility of rebellion high. So here comes John the baptist – possibly from the Essene community at Umran with a different form of purification – baptism. 🙂 – dissident Essene? Did Jesus take over some of John’s disciples? Jesus’ conversion. Did Jesus baptize or just his disciples? Just because the sources vary – Gospel of John is different. But don’t all sources vary – or are they copied sources? Is validation only copying? (lol) John said the kingdom of God was coming – Jesus said it was here. I notice a small problem here – if the New Testament falls in line with Old Testament prophesy the writers of the New Testament were looking for guidance in how to write it – following the example. If the New Testament differs from what has gone before then the early Church fathers added it. What Shorto is doing though is reporting on the deconstruction of the New Testament by scholars and in view of the Dead Sea Scrolls and the finds at Nag Hammadi. There are 14 chapters and I’m not going to summarize all of them – it’s good, not the best, and it supports the traditionalists in ways many Jesus scholars don’t. I’m sorry it took me so long to finish because I kind of lost the thread along the way.